In 1993, I made a film for BBC Northern Ireland’s rightly renowned Spotlight series about a FRU spy variously called Thomas Doheny, Samuel Rosenfeld or a range of other names. Thomas Doheny has been laughed at (possibly deliberately) in some quarters but the essence of his literally explosive story has never been disproved . Doheny was and did exactly what it said on his British intelligence tin. Further confirmation of this came from the British army itself – i.e. 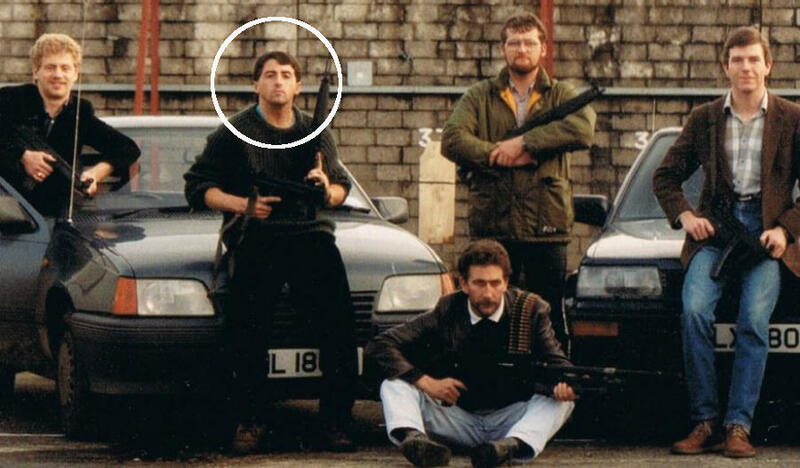 that the FRU, or what was later known as “JSG” (Joint Intelligence Group) used him as an agent in cross border missions until he was found to be “unsuitable”. FRU spooks think its all over and they got away with it. They’re wrong. In keeping with the staged photo above, people imagine that the FRU went round the back streets and hills of Ireland, ducking and diving, guns concealed in glove compartments and stuffed down trouser belts etc – a life of derring do. However if we read the more credible accounts of those who served in the FRU, they were often an ill disciplined group involved in frequent bouts of drinking “jollies” and ignoring basic army procedures. This is perhaps why proper soldiers in the British army refer to groups like the FRU as “slime”. Those real soldiers were also well aware that the FRU’s soldiering “exploits” were usually more to do with the manipulation of pathetic people or people with pathological problems whom the FRU could recruit to its ultimately murderous cause.